Theme: It is a necessity for people to unite as one in order to fight for the rights of all and to survive through difficult times. This idea is reoccurring throughout the entire novel and can be seen as the main idea throughout the book; it also connects to the song The Battle Hymn of the Republic. 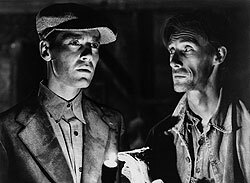 In The Grapes of Wrath, the farmers and all the families need to unite as one and work together in order to make it through each day and fight off the people of California who they are trying to make their livings off of. Morally the farmers and their families are all there for each other for support and physically they all help each other out in any ways they can. For example, when the Joad family arrives at the government camp, a family invites Tom to breakfast and then offers to take him along to the job that they have to see if he can find one too. The families all watch over each others children and they are all very grateful of this. If the families did not unite as one, and become a unit during their travels and hard times of trying to survive off of almost nothing, then they would probably have a lot harder of a time trying to be strong in their mindsets and trying to live through each day. Each and everyone one of the families protect each other and they continue to fight for the same thing throughout the novel. All of them want to make money and they never seem to give up, no matter what, in order to help their families survive. The farmers do not tend to physically fight but mentally they are fighting because they are going through many ups and downs in their daily lives. They continue to migrate towards jobs to show the "bosses" that they will do what they need to support themselves and they fight with themselves to be strong through even the worst of times. The Battle Hymn also connects to the theme of The Grapes of Wrath, because the Republic is the unit that is being referred to in the song is like the unit of people working together. In the song lyrics it mentions people marching on and this is basically connecting to the people in the novel marching on to make it through each day of their lives and fighting to survive in a difficult world. Because of all of these ideas the theme of The Grapes of Wrath can be seen that people need to work with each other in order to fight for their rights in society and make it through life.